With a huge choice of codecs, industry standard hardware compatibility options and leading video editing software, GVS9000 4NXU VTR is a professional video server and non-linear VTR with uncompressed dual-link HD SDI, 4:2:2 1080i/p 4:4:4, 2K support that provides recording media direct from camera SDI output at rate of 1.4 Gigabit/sec up to 3.0 Gigabit/sec on secure transparent storage and sharing over dual 4/8 Gb/s fibre and dual 10 Gigabit network or InfiniBand for a wide variety of digital media. It is ideal for Feature Film Production, Live Event Broadcast, Post Houses, Design Facilities, Medical, Science, and Educational applications; anywhere large amounts of high quality content acquisition, working storage, editing, transport and archival is done. The GVS9000 4NXU Pro VTR allows up to 16 concurrent HD users to share content at the same time. The storage technology allows 16xHD SDI and file based, uncompressed content to be accessed at the same time. This technology introduces a remarkable production capability to capture, color correct and edit in a complete shared environment. Combining 16 Nomadic storage devices with the GVS9000 4NXU Pro VTR offers excellent performance, superb integration with a variety of systems, and enables cost effective electronic transfer of high-resolution masters. Beginning with capture, direct from digital camera, tape or direct to disk animation – GVS9000 4NXU Pro VTR technology records unmatched quality pixel to pixel at exact selected resolution, with a number of playback options including single frame, slow-mo, and specific field. Throughout the post process, from color correction to DSR, editing, effects, audio processing finishing and optional down conversion for distribution, 4NXU Pro VTR can integrate with or replace portions of existing systems. The GVS9000 4NXU Pro VTR offers uncompressed to MPEG, IMX, JPEG, ProRes, DNxHD, and optional codecs. It comes standard with independent digital, format free audio I/O channels and a choice of 16, 20 or 24-bit audio at 44.1, 48 kHz with the option to upgrade to 96 or 192kHz which gives the ability to sync audio to video clips recorded at any frame rate. With unlimited virtual channels and independent channel editing capabilities, the 4NXU Pro VTR supports the most rigorous audio requirements during the digital mastering process. Whatever your requirements, GVS9000 4NXU Pro VTR offers flexibility, speed, and the highest possible image quality. Using visually lossless uncompressed or a number of different codecs, and highly efficient Quality Encoding fiber based shared image storage the 4NXU Pro VTR provides the most accurate digital replica of your projects available today. Support for 23.97, 24, 25, 29.97, 30, 48, 50, 59.94, and 60 frame images, Video sync input, Bi and Tri-Level, Time code, LTC In/Out, progressive, interlaced and segmented frames, non-drop frame, allows you to work with images at their native resolution and frame rate. With this introduction, 4NXU Pro VTR provides the best platform for cost effective HD production and post as well as 2K and 4K digital intermediate . - Saves hours of transfer time between capture units and Audio/Video Post. - Eliminates tape transfers using real-time technology without rendering video effects to disk. - Saves 2 HOURS of transfer time per hour of material, allowing audio/video post to immediately start working against new cut, while video is being captured. - Start editing in Final Cut Pro, Avid, or other editing applications while additional material is being captured. -GVS9000 4NXU Pro VTR Capture can perform very long captures without stopping, during which you can review, log or edit the incoming video and audio. Solution is a powerful, full-featured yet flexible, digital media managment system which helps users at every stage of the editing process, from initial ingust, through to wrapping up and archiving a finished project. Imagine how many hours are spent in your organization combing through stacks of video, audio, photos, and XML, flipping through different effects, etc., trying to find that data that you know you have. With GVS 4NXU Pro MAM's user-friendly search and retrieval capabilities you can locate, catalog and manage your video and worknative with your NLE assets on any given platform, FCP, AVID, and Adobe in a fraction of the time. Combined with the GVS9000 4NXU Pro solution it is one of the best ways for media-rich organizations to save time and money. 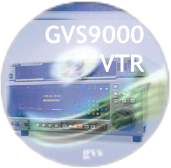 GVS9000VTR, is able to playback a wide variety of different format. With appropriate GVS9000 4NXU VTR, a single GVS9000 4NXU VTR unit can *NATIVELY* play back almost every QuickTime video format currently available, plus MPEG2 and MPEG4, DV, DNxHD Avid, Meridien OMF picture at NTSC, PAL and Film speeds, all without the need to convert or transcode the video. This unique capability sets GVS9000 4NXU VTR aside from all other DDRs at any price, which generally use proprietary file formats. File format compatibility, superb video performance, flexible integration and easy networking of video and audio makes GVS9000 4NXU VTR the obvious choice for modern mix stage and video infrastructure. Ability to provide user in field ability to record real-time 2K, 4:4:4, 4:2:2 5Mbit/s to Uncompressed direct recording of digital content with multiple proxies file format generation, with simple software control module user are able to select any number of low resolution proxies files with the same file name so it provides a easy of editing of daily as well as ability to preview and change format on the file, so content can be provided to remote location extremely fast and secure.. Finally, multiple sources of QuickTime material can be played back in sync, without transferring to another medium, like DVD or Tape. GVS9000 4NXU VTR configuration is extremely flexible, supporting almost any setup you may ever need, sync to external TC, generate timecode, manual control with jog shuttle wheel, even run GVS9000 4NXU VTR units off a multi-machine 9-pin synchronizer. Each GVS9000 4NXU VTR can also play back 2 channels of sound in sync ideal for 3DStereoscopic capture and preview. With its strong networking, and QuickTime compatibility, GVS9000 4NXU Pro VTR breaks new ground for rapid turnaround shows. Support for a variety of GVS9000 VTR models allows a scalable solution, from offline capture using inexpensive HD codecs (MPEG), through to Uncompressed HD for instant on-line editing. GVS9000 4NXU Pro VTR units can be easily ganged together for multi-camera environments, and automatic file naming and embedding of identification metadata makes life even easier for video editors. Time stamped QuickTime movies recorded with GVS9000 4NXU Pro VTR spot right into place in Final Cut Pro and other video editing systems, and can also be simply imported into Avid edit systems or directed running Scratch in Windows mode- no capture from video tape able to maximize your environment required. Besides the benefits of timestamped recording, GVS9000 4NXU Pro VTR offers much more to the TV production industry. As a 9-pin controllable playback system, you can just as easily playback your recorded files under 9-pin control, or by chasing timecode for multi- machine synchronized playback as well as TCP/IP network interface.